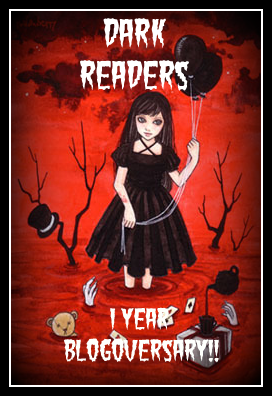 Dark-Readers: Dark Readers 1 Year Blogoversary!!! Dark Readers 1 Year Blogoversary!!! So there it is Dark Readers one year Blogoversary. I never thought I would say that let alone talking about it right now. When I first started this blog I hadn't any idea how to use blogger or how to create a network were I could talk books. When I met Dee at GCReading my first "Book Blogger friend" she was so nice and made me realise maybe I could do it. So I started making layouts started practising with blogger and eventually I got the hang of it. Now I had to start reading loads of books and Reviewing them. I could do the first one but when it came to writing reviews my first thought was "How do I write this without giving the whole plot away?" But I kept practising and now I think I am MUCH better. Its true practise does make perfect. After talking to loads of authors and bloggers on twitter I started to really enjoy what I do even more. Once I got to know publishers and started getting noticed I realised this could all work out. I loved that people actually took the time to read my reviews. Me? the girl who had no idea what she was doing (at first ;) ). Publishers started sending me their books to review and starting wanting me to host blog tours authors were RT my reviews on their twitters.Was this really happening? My hardwork was paying off. Congrats Casey and DR. Happy First! CONGRATS! Casey. May you have more more anniversary to come. Congratulations! You have a blog I love to visit EVERY day. Thank you. aww girl your post just made me all teary eyed. I am happy we met (not in person, but hopefully soon). You're awesome! I feel like I've missed so much on your blog and everyone elses lately. I love chatting with you in our little chatroom lol. You're hilarious and think just like me!